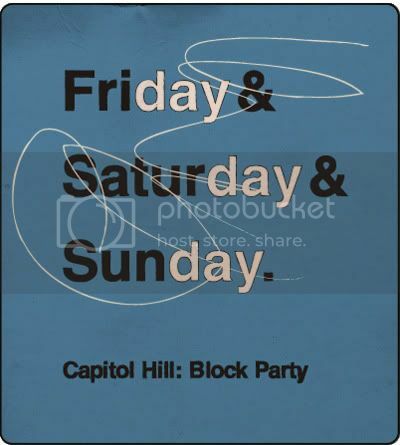 for Young Moderns: BLOCK PARTY: STARTS TOMORROW! TOMORROW, the kind people of Capitol Hill Seattle Washington, invite you to stop over to the neighborhood for a block party. Friday night is completely sold out! So go to CHBP's website to find tickets CHEAP for Saturday and Sunday. All week FYM has been featuring colorful design, and videos to get you pumped for this huge event. If you can't make it to Seattle this weekend, FYM will be at the show for you. We will be on the spot, with live updates, photos, video, and in-depth features about the neighborhood scene! So grab your fixie, put on your cut-off Levis-shorts, and come over!